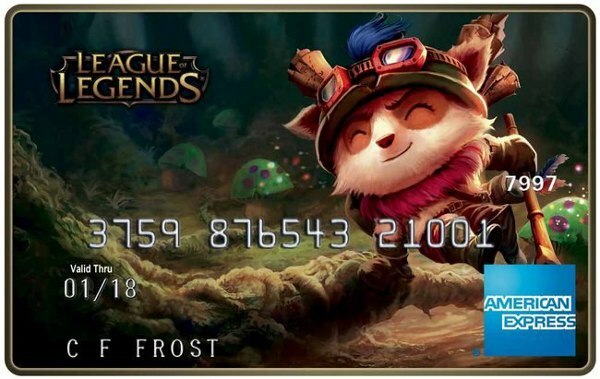 American Express is teaming up with Riot Games to produce League of Legends debit cards. These cards will allow LoL players to earn Riot Points with every use. Riot Points are an in-game currency normally acquired by spending real-world money. RPs can be spent on alternate champion outfits or progression boosters. They can also be used to permanently unlock specific Champions. Players have to otherwise play a rotating set of free Champions. By registering a League of Legends prepaid card, you'll earn 1,000 Riot Points (roughly $7.70). You'll get another grand by loading $20 into the account or making your first 10 purchases. If you use Direct Deposit to add $20 or more to your account, you'll earn 10,000 RPs. Gamers might be a bit wary of branded debit cards after that whole Capcom debacle a few years back. However, American Express says that there are no credit checks for signing up. There are also no hidden fees or minimum balance requirements. We'll find out more of the fine print once the cards after officially announced on Wednesday, though. A New York Times article on the debit card explains what American Express and Riot Games both get from the partnerships. American Express makes inroads with the 32 million LoL players. That community is primarily made up of 18- to 24-year-old males, a demographic that's hard to reach through traditional mediums like television. Riot, meanwhile, gets additional cash to help with expanding the global presence of the game. "There is a great opportunity for brands here, particularly brands that make sense for our players,” said Dustin Beck, Riot Games vice president of electronic sports. Season 3 of the League of Legends Championship Series is currently underway. Digital banner ads for the new debit cards will begin appearing on the Championship Series website on Wednesday. American Express will also launch a website and 30-second ad to explain the card.